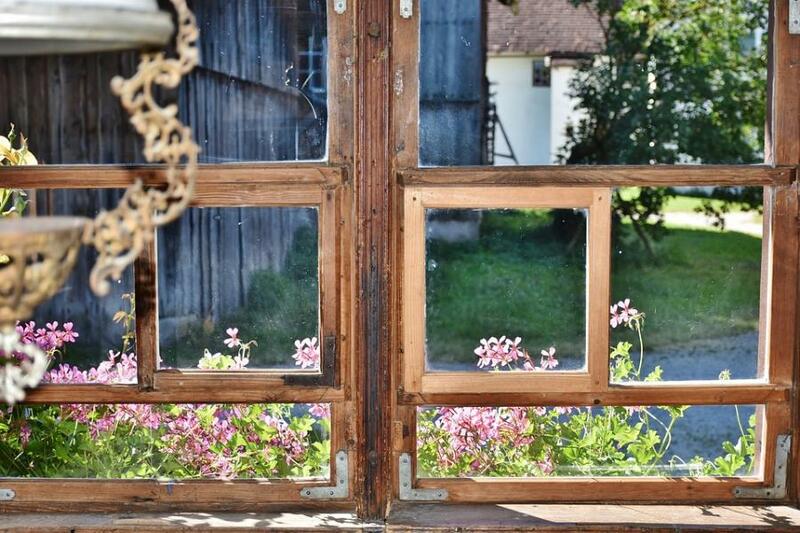 Wait before you throw out your old windows, or consider repurposing salvaged old windows into creative DIY projects. You can easily breathe new life into old windows, transforming them into functional furniture or upgrade your home décor. Prepare to be amazed at the endless possibilities of innovation, as you turn trash to treasure! Semi-open storage or see-through cabinetry displays are still very much in vogue and allows you to admire your most precious possessions. You can build a custom cabinet using small old window frames to show off curio items, which can be placed indoors or outdoors. Use a cabinet made from old windows to place garden tools, pots, and collectibles when not being used. Keep a rustic vibe going by either leaving the frames of the old windows unpainted or mix and match colors and handles for visual appeal. There’s nothing chicer than repurposing an old window to frame artwork, kitschy vintage finds or photos of family. Feel free to first sand down the surface of the wood so that it is nice and smooth, before adding a layer of primer and paint to freshen it up. Once the window has the look you want, add a heavy support string to hang up photos, a wreath, or pop in a poster print. Your new frame display can be leaned against a wall, hung up on supports on a wall, or create some visual interest in a hallway. Instead of shelling out money for a fancy wall divider, why not create a suspended partition, or custom room divider using old windows? Attach a series of windows of equal size with hinges, and either leave the pane of the windows clear or frosted. Place posts in your ceiling, and hang up windows of varying sizes by using chains and S-hooks to create a new space within a larger room. You can use floating windows as a semi-privacy wall to section off porches, break up a large living room, or section off a reading nook by a window. Using a chain and hook system, you can rearrange the windows easily to update the look. Next time you choose to serve breakfast in bed or make time to tea, break out a serving tray made with a vintage window. Dress up the window pane sections with paint, wallpaper, or replace it with frosted panels. Add some decorative handles that are sturdy on either end or choose to install some heavy rope handles. Have fun exposing the natural color of the window frame, or paint it and sand it to give it a more polished look. Scooping up an overpriced mirror for your hallway or a wall is nowhere as fantastic as upcycling an old mirror for the purpose. Choose a large window that could use a new life and home from a thrift store or old house, and replace the glass with a mirror panel instead. Feel free to add hooks at the top or bottom of the window frame mirror to hang up keys or lightweight accessories.